A birthday party for your 4, 5, 6, or 7 year old! How exciting! Children in this age group enjoy almost all birthday parties that we host at Kids Kustom Parties in Palatine, IL. In late preschool, kindergarten, and primary grades, children are more self-sufficient than in earlier years. These children are accustomed to organized activities with a splash of their own creativity. They’re rarely afraid of masked characters that may, for example, frighten a two-year-old. In fact, boys and girls in this age group really thrive on fun party characters and themes. They love interacting with the characters throughout the entire party. They also really enjoy the photo booth and props, obstacle courses, tattoos, our 4-station hair and nail salon and more! Prize games, tug-of-war, volleyball, musical chairs, Freeze dance, and crafts are also appreciated by this age group. They enjoy balloon artists and other kids entertainment for parties. Please note, we can also divide the room and provide two “separate” parties. For example, we can offer a superhero experience on one side of the room and a princess party on the other. This often works well when the guest list is more diverse. For example, it’s a great option for multi-age and multi-gender parties. Keep in mind that four-year-old children may enjoy many of the same birthday parties as three-year-old-children. 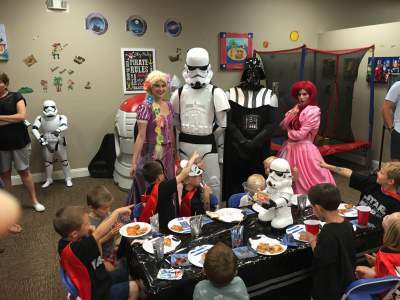 By contrast, seven-year-olds may enjoy the themes of tween birthday parties, such as a Star Wars theme.